Spring has sprung with an explosion of color, like fireworks on the 4th of July! I don’t always get the photo! I needed to get a good photo of a red shoulder hawk. 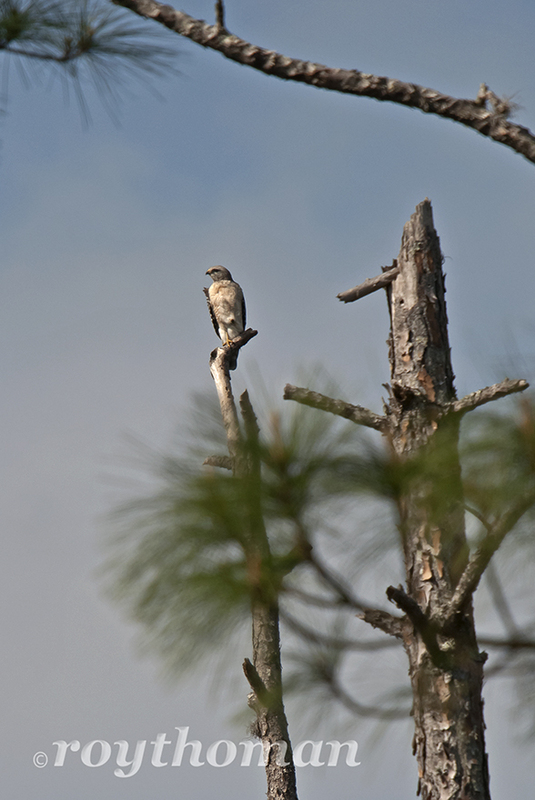 I was at the Tosohatchee Wildlife Management area a few weeks ago and I saw a nice one. The hawk was hunting in a location that would make it easy to get a good photo. So when I needed to get a red shoulder, I thought I would return to the TWMA. Hopefully my friend, the red shoulder hawk, would still be there. I knew it was a long shot; things rarely work out the way we want them to. I arrived at the Tosohatchee in the morning to take advantage of the morning light. I drove to the place where the he had been hunting on my previous trip. Unfortunately, he was nowhere to be seen. I drove deeper into the TWMA to maybe find another hawk. I did see a kestrel, but he was too far away to get a good photo. I thought this may be a good time to go back and check on my red shoulder friend. I drove back to his hunting grounds and still no hawk. I still had lots of time, so I thought I would drive around and see what else I might find. 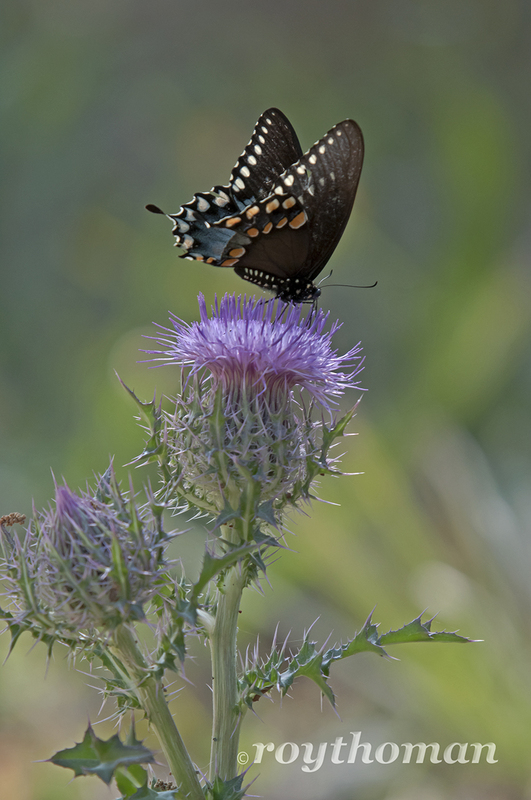 I only got a few yards and I saw a pretty swallowtail butterfly on a thistle. I got out of the car and started to photograph the butterfly. I took quite a few photos when I finally looked around me. 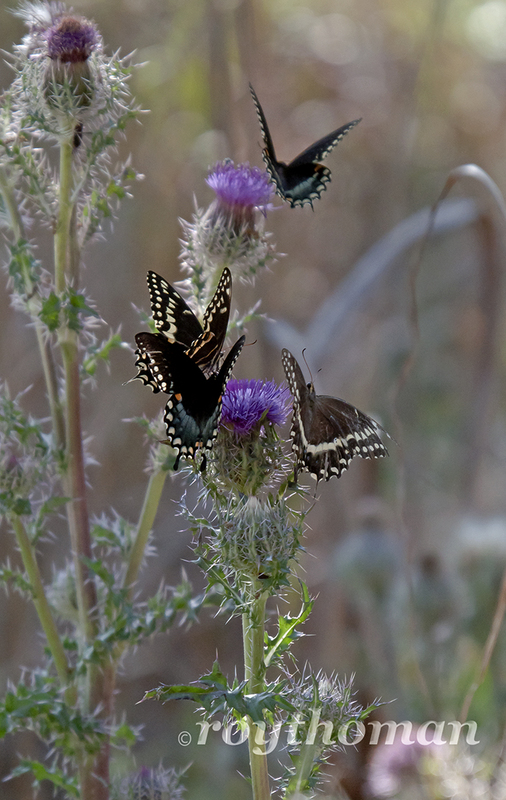 There was not just the one butterfly; there were 15 – 20 of them on thistles all around me. I was having fun with the butterflies when I heard my hawk calling close by. For the longest time I could only hear it calling to its mate. Then I saw it flying over the trees. The hawk was heading toward the area that I had seen him in before. I followed his flight through the trees. I was looking through the trees and I saw him. He landed in a dead tree. The tree that he landed on, although it was in plain sight, it was way too far away to get a good photo. We sat and watched each other for the longest time. He looked at me and I looked at him. He must not have been totally looking at me. He jumped off of his tree and down to the ground, as if he found something to pounce on. I watched for the longest time, but I never saw him again that day. I failed on this trip to get my hawk photo, but just because you fail at your main objective, that doesn’t mean the whole trip needs to be a failure. Even though I wasn’t able to take any great photos, I still saw lots of cool things and had a great time in the field! I ended up seeing over a dozen hawks that day. I saw this eagle sitting on a power line tower. The eagle stared at me through the steel bars of the tower for a long time before it flew. I saw some pretty purple flowers. I saw some pretty yellow flowers. I saw some cute and fuzzy critters. I saw some not so cute and fuzzy critters. But don’t tell the armadillo that it isn’t cute. I saw some mean and nasy critters. I saw a space alien. I saw some cute and not so fuzzy critters. The one that flew away. Why do birds wait until you set your exposure, focus, and then fly before you get the photo? We have this strange plant in our yard that a friend gave us. I was not sure what it was called, I had to look it up. It was really small when she gave it to us, it had long thin leaves with little balls on them. It turns out that the little balls create a new plant when the fall off, so we now have many more plants than we started with. The plants that we started with have gotten really tall, they are 3-4 feet tall now. They have started blooming now too. They’ve got these very pretty red bell shaped blossoms on them. So of course I wanted to photograph them, so now that I have photographed them, I thought that I better check to see what they are. I did a quick Google search and found that they are called Chandelier plants among other names. So I thought I would share my Chandelier plants with you.